What fun! My first Spartan Sprint. Best DX was NK6A in CA. 20M was the workhorse band. 40M was crowded below 7030 by a DX pileup. My only rig set up at the moment is an FT-840, so for now it's the 'Tubby' division. The antenna is a long-wire 105' long and up 45 feet, worked against ground. Conditions good overall, 10M openings earlier in the day to Europe, South America and JA. No Sprint activity heard 10M or 15M- too late in the evening local time. The days are getting longer and so is 20M. Nice to work stations on 20 for 45 minutes before going to 40. Nice to see some better conditions and more articipation. Best DX was Don NK6A in CA next was Larry KFØN in IA. Great to work Dave, K1SWL, on 2 bands. 20M was the best band for me. I operated for 45 minutes with the KX3 and Windom OCF dipole. Thanks all. Short evening on 40 meters. Nice to once again hear some familiar Spartan Sprinters, but not many of them were heard down here into Florida this evening. Big signal of the evening was AB9CA but then Dave is always easy copy here. Then got to listening around after I had given up for the evening and was pleased to be able to work two more “SS Friends.” Thanks for the contacts. Good conditions. 20M started out strong with 6Qs. Rest on 40M. Next month I'll have something for 80M. S7 QRN here in St. Louis. Heard a few stations but could only copy one. Great crowd tonight and great fun. My setup Rockmite 600mw, power supply 20lbs, antenna tuner 15 lbs, keyer paddle 1 or 2 lbs - about 40 lbs total :( I had about an hour available to work the sprint. I originally tried calling CQ for about 45-50 minutes with a Pixie II, RJ1 key powered by a 9 volt battery. I had no replies (to date I have only made one QSO across town with the Pixie II). According to my wattmeter I was getting out around 250mw. In the last 5 or 10 minutes I decided to switch to the Rockmite. I worked KR4WI on my first CQ with about 600mw out. I am still determined to make an unscheduled qso with my Pixie II! Good to see more activity! Rig was FT-857 at 5w to 100' wire. Condx on 20 seemed decent but not too many there - 7 Q's. 40 was the main band although it was fairly noisy - 27 Qs. And managed 6 Qs on 80 in spite of the noise level. Worked NQ2W, NK6A, KG3W, W1PID, N5GW, K4BAI, WA4ZOF, and K5JHP on two bands - hope I didn't leave out someone. No one on all three. Had someone whose call contained 'XM'answering me on 80 but I could not get the rest of the call. QSB kept getting it. Sorry about that. Hate to miss a good one. The bands were noisier than I had hoped. Guess we were hearing the lightning in TX and off the coast of SC. But fun never the less. Thanks to all who stopped by. See everyone next month. Running the ATS-3 with three 300 mAh LiPo batteries, providing 5W out to my 18AVQ vertical and a final total of 15 QSOs this month. I had a GREAT TIME with excellent 40M conditions. This month however, I had ONE contact on 20M. The band sounded pretty good, but the QSB was a real problem. I parked on 40M for what was left of the first hour and a bit of the second, and had fun. It was good to find some local folks like N5EM. I made 11 contacts on 40M before moving on to 80M for a final three. Always hoping for more 20M ops! Great contest participation this evening. I worked many regulars and some new ops I had not heard before. NBØW had a great three watt signal the rare state of Nebraska. Twenty meters was open here for the first half hour of the contest. Forty meters went long shortly after nine pm local time so I packed it in early. I worked Jim, W1PID on both 20 and 40 which was a treat. 40 meters was a real mess here, between the SSB SA QRM and the digital stuff; I almost wish we could park the 40 meter calling frequency around 7106 kHz or so. It seems a lot less congested up there than our beloved 7040! I know I missed a few of you; between the jammer and the SA SSB QRM it was a real challenge to copy everyone. Thank to all who rang my doorbell! It made for an enjoyable contest. With more light on the Heavyside layers, better conditions should lay ahead. Didn’t hear as many on the bands tonight. Maybe the cool weather? Set up is HB1B at 4 watts. Palm paddle, T1 tuner, and 850 mah lipo battery. Inverted V at 32 foot peak. Missed many of the stations that were search and pounce. Worked 7 stations on 20, including AL,MS,TX,KS,WA,UT,and CA. On 40 mtrs. worked IA,NY,NH,GA,AR, and AL again which was AB9CA. Tnx Dave! Went down to the lower part of 40 CW and heard a faint station calling CQ... 7X??? Sent my call twice and back comes Med; 7X4AN in Algeria. Only worked him on 20 in the daylight hours, and not for a long time. Over 1,000 miles per watt on 40 mtrs. Got a real kick out of that. Thanks for the fun evening. See ya next month. I fared better this month with 5 Qs. One on 20 and 4 on 40, including fellow HQRP-er N5EM. Went to 80 for a while, but no Spartan activity heard. Thanks, also, to K5JHP, K4BAI, AB9CA, and KH2AR/W4. Rig: Yaesu FT-817 @ 5 watts to my 33' end-fed wire. Better activity this month. 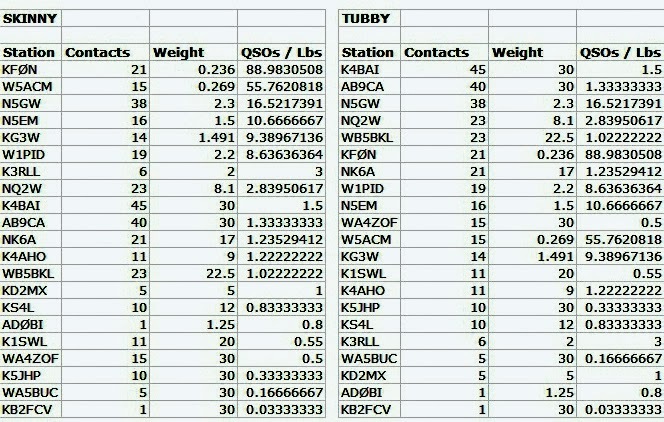 Total QSOs by band: 20M: 13. 40M: 25. 80M: 7. All three bands in good condition. A lot of digital QRM on 40M. 80M in good shape with QSOs out to NY, WI, and TX, but not many stations heard on that band. Thanks for all QSOs. First Spartan Sprint in a while. Only had about 45 minutes. Used my K3/100 at 5 w. with my 44' vertical dipole at about 50.' Contacts split between 20m and 40m. Tried 80m with my 80m inverted V, but nothing heard there. Good to work some old friends! on 40m. Heard more but the paths weren't mutual. K1 at 5W to a 2-element mini-beam at 25ft for 10, 15, and 20 meters, an inverted vee at 40ft for 40m, and a ground mounted, home-brewed, near bottom-loaded vertical for 80m. I apologize for the rough sending. I'm still getting used to my new homebrew paddle. It was privilege to make 8 QSOs on 20, 13 on 40, and 2 on 80. I missed one on 20. Too far into the noise to get the call. Hopefully, next time...Not much activity on 80 but my vertical isn't the best judge. Quite a bit of QRN on 40. 3-bander with K4BAI; 2-banders (20 and 40) with AB9CA, K4AHO, N5GW, and WB5BKL. Loads of fun. Looking forward to next month. Thanks for the opportunity! K3/10 @ 5W to a 15M delta loop, a 20M delta loop, a 40M dipole or a 40M EDZepp. 16 states this time. Only one contact on 15M. Several doubles but no one on three bands here. Enough activity to keep things interesting for the whole two hours, but we can always use more! Best signal of the evening was N5GW @ 3w from MS. My thanks to all. Had fun.